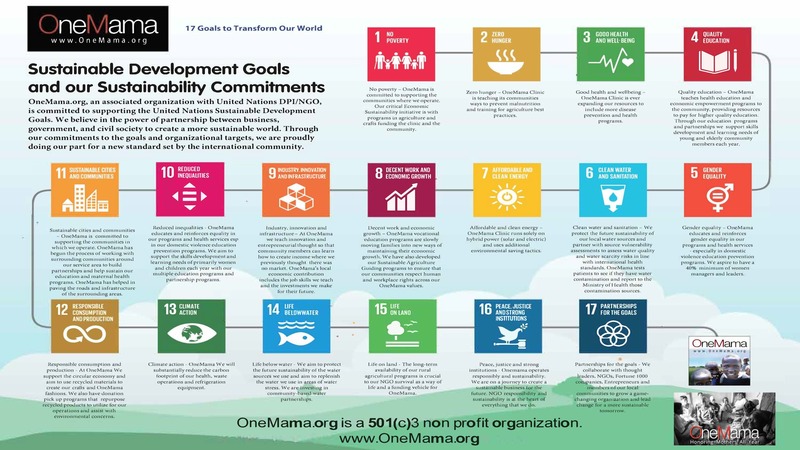 OneMama.org is excited to announce our pledge towards the United Nations 17 Sustainable Development Goals! On the 25 September 2015, United Nations world leaders laid down 17 Sustainable Development Goals (SDGs) to end poverty, fight inequality and injustice, and tackle climate change by 2030. OneMama.org is helping to support these goals through its international efforts to create a more sustainable world. Onemama.org an associated organization with United Nations DPI/NGO is committed to supporting the Sustainable Development Goals. We believe in the power of partnership between business, government and civil society to create a more sustainable world. Through our commitments to the goals and organizational targets, we are proudly doing our part for a new standard set by the international community. 1. 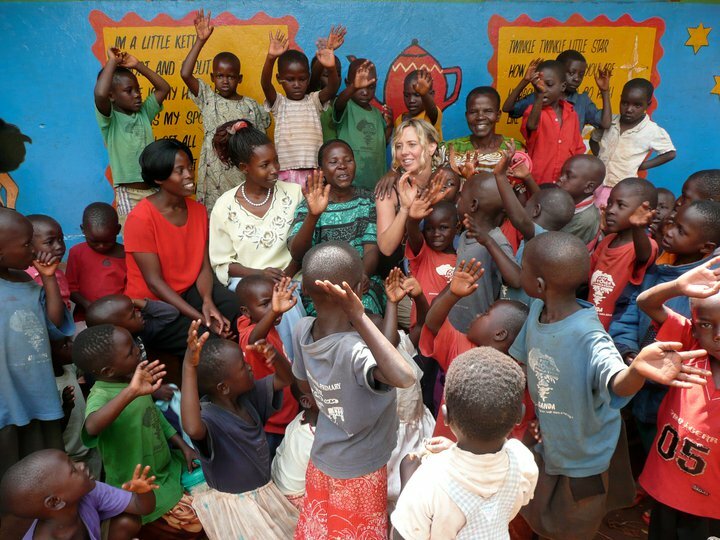 No poverty – OneMama is committed to supporting the communities where we operate. Our critical Economic Sustainability initiative is with programs in agriculture and crafts funding the clinic and the community. 2. Zero hunger – OneMama Clinic is teaching its communities ways to prevent malnutrition and training for agriculture best practices. 3. Good health and well-being – Onemama Clinic is ever expanding our resources to include more disease prevention and health programs. 4. Quality education – OneMama teaches health education and economic empowerment programs to the community, providing resources to pay for higher quality education. Through our education programs and partnerships we support skills development and learning needs of young and elderly community members each year. 5. Gender equality – OneMama educates and reinforces gender equality in our programs and health services – especially in domestic violence education prevention programs. We aspire to have a 40% minimum of women managers and leaders. 6. Clean water and sanitation – We protect the future sustainability of our local water sources and partner with source vulnerability assessments to assess water quality and water scarcity risks in line with international health standards. OneMama tests patients to see if they have water contamination and report to the Ministry of Health those contamination sources. 7. Affordable and clean energy – OneMama Clinic runs solely on hybrid power ( solar and electric) and uses additional environmental saving tactics. 8. Decent work and economic growth – OneMama vocational education programs are slowly moving families into new ways of maintaining their economic growth. We have also developed our Sustainable Agriculture Guiding programs to ensure that our communities respect human and workplace rights across our OneMama values. 9. Industry, innovation and infrastructure – At OneMama we teach innovation and entrepreneurial thought so that community members can learn how to create income where we previously thought there was no market. OneMama’s local economic contribution includes the job skills we teach and the investments we make for their future. 10. Reduced inequalities – OneMama educates and reinforces equality in our programs and health services esp in our domestic violence education prevention programs. We aim to support the skills development and learning needs of primarily women and children each year with our multiple education programs and partnership programs. 11. Sustainable cities and communities – OneMama is committed to supporting the communities in which we operate. OneMama has begun the process of working with surrounding communities around our service area to build partnerships and help sustain our education and maternal health programs. OneMama has helped in paving the roads and infrastructure of the surrounding areas. 12. Responsible consumption and production – At OneMama We support the circular economy and aim to use recycled materials to create our crafts and OneMama fashions. We also have donation pick up programs that re-purpose recycled products to utilize for our operations and assist with environmental concerns. 13. Climate action – OneMama We will substantially reduce the carbon footprint of our health, waste operations and refrigeration equipment. 14. Life below water – We aim to protect the future sustainability of the water sources we use and aim to replenish the water we use in areas of water stress. We are investing in community-based water partnerships. 15. Life on land – The long-term availability of our rural agricultural programs is crucial to our NGO survival as a way of life and a funding vehicle for OneMama. 16. Peace, justice and strong institutions – Onemama operates responsibly and sustainability. We are on a journey to create a sustainable business for the future. NGO responsibility and sustainability is at the heart of everything that we do. 17. Partnerships for the goals – We collaborate with thought leaders, NGOs, Fortune 1000 companies, Entrepreneurs and members of our local communities to grow a game-changing organization and lead change for a more sustainable tomorrow.